The lines that seperate tablets, notebooks, and all-in-ones have increasingly blurred over the past few years—and prices have begun following that trend. Gateway’s new 19.5-inch Gateway One ZX4270, is priced at less than $400, although the company sacrificed some niceties to hit that mark. Thankfully, the $1,000 or so prices that PC vendors used to charge for an all-in-one machine have faded away, thanks to lower prices in the flat-panel market. Now, low-end AIO machines are pushing down below $500, as manufacturers try and drive sales by charging less. Nevertheless, if you’re in the market for an all-in-one PC, it pays to pay attention to what’s under the hood. 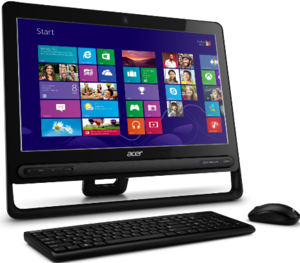 Acer also announced its own all-in-one on Friday, which also foregoes a touchscreen; the $600 Acer Aspire ZC-605 includes a 19.5-inch display and a terabyte hard drive, the company said. Since Gateway’s AIO is powered by Windows 8, keep in mind that you’ll require the included keyboard and mouse to use it—not that big of a deal, actually, although using the mouse’s scroll wheel to scroll horizontally can be a little odd. The ZX4270 also includes an AMD Vision A4 5000 processor (1.5GHz, 2MB total cache) and 4GB DDR3 dual-channel memory, plus a AMD Radeon HD 8300 graphics card. Don’t expect to use the ZX4270 as a gaming machine, but for web surfing and basic office tasks, it should do just fine. Speaking of Office, Gateway doesn’t include it; that package is typically included on the Microsoft Surface tablets or the new generation of “mini” Windows tablets—which you’d need to plug into a separate monitor to replicate the AIO experience, anyway. Other specs include hard drives up to 750GB, an optical drive, a 1080p webcam, plus two USB 3.0 ports, four USB 2.0 ports, and speakers. With low-end machines, you might be best served visiting a showroom and trying one out for yourself. There’s nothing wrong with a machine like this on the surface; over time, however, as you load up utilities, toolbars, and other bits of digitial detritus, you may find it becoming a bit poky. For help keeping a PC like this lean, mean, and clean, check out our previous stories on how to clean up your PC, along with a real-world speed test on five popular clean-up utilities.